This Large Rabbit Hutch would make a great home for a group of small rabbits.. Selecting a Large Rabbit Hutch. No rabbit hutch can be too large, in fact the bigger the better. 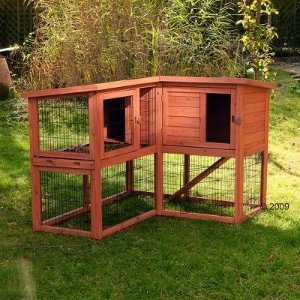 Buy or make the largest rabbit hutch you can manage. There should be at least two rooms making up your rabbit hutch. 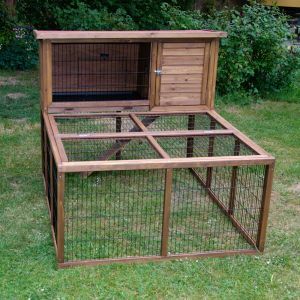 The main cage area should have a wire front and be spacious enough for your rabbits to hop around. Food should be kept to this area and a litter tray be placed in a corner. 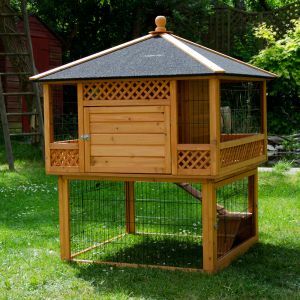 A sleeping area with access onto the main rabbit cage should have solid walls and a door where your rabbits can retreat and relax with some privacy. Large breeds of rabbits need a lot of space, both for living and exercise. A hutch is not ideal, especially ones with different levels, as larger rabbits cannot negotiate steps as well as smaller rabbits. A rabbit proofed room in your home and a dog basket to sleep in is ideal. 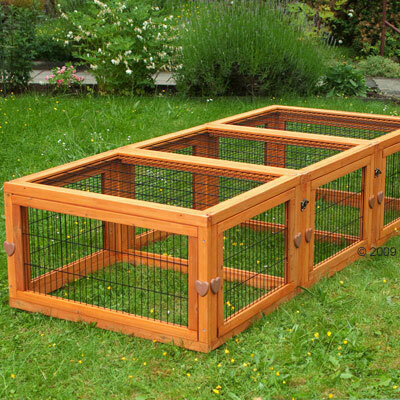 A dog crate with a plastic base can be ideal to convert into a large rabbit hutch. 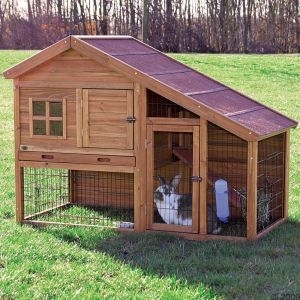 As a guide the minimum size of the rabbit hutch should be 180cm long and 60 cm high. 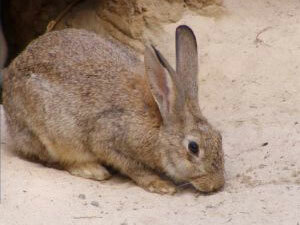 Your giant rabbit should also be given daily access to a large rabbit run in the garden for exercise. Many giant rabbits are housed in small garden sheds or children’s wendy houses converted into large rabbit hutches. Make sure outdoor housing is secure enough to protect your rabbit from rats and foxes. Rabbits are social animals. Unless your rabbit lives indoors with human company for most of the day, it is good to plan to keep two rabbits together. A male/female pair is easiest, but don't forget that both rabbits will need to be neutered, and introductions carefully supervised. 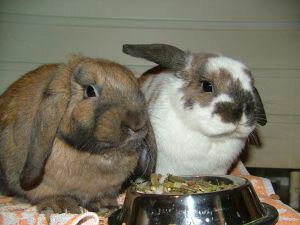 Two small rabbits require a large rabbit hutch, with at least 150cm x 60cm floor space, by 60cm tall. For two large rabbits this should be at least 185cm x 90cm floor space, by 90cm tall. The rabbits need to be able to stretch out lengthways, hop around, and stand up on their hind legs; otherwise they may experience skeletal aches and pains from being too cramped. You should also remember that rabbits prefer to sleep separately at night, so each will need their own nesting area within a large rabbit hutch. Next: Creating a Large Rabbit Hutch. 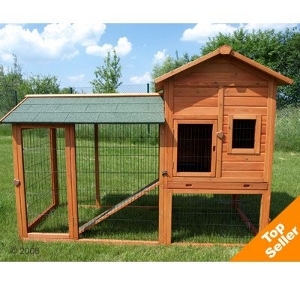 The Rabbit Hutch Outback Corner is a quality two storey wooden large rabbit hutch, with a sleeping den, a ground level rabbit run and a great space saving design.